exswoo: Unless I'm reading this wrong it looks like it's dead no matter how White responds. Jasonred : Doesn't a for White kill yourself in gote? Come to think of it, I think that's true for White 3 in the previous diagram... no wait, I'm wrong... White ONE(1) kills herself in gote in the middle diagram, doesn't she? Lithel? : I believe White is dead as she stands. White has three options: Capture, Seki, and Wait. Let's look at capture first. 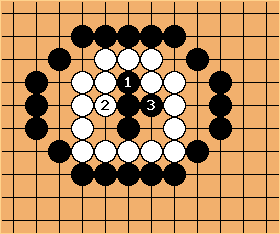 Even with five free moves, White can not build a second eye. Note that a, b, and the spaces around them do not help in forming a second eye. Lithel? : If White waits, Black can fill all outside liberties, then fill a, b, c, and d in order. In every one of these cases, the shape that Black has will turn into one of the killable eye shapes if captured. Therefore White has no way to save the group by waiting. Lithel? : Since capture and wait both fail, seki also fails. 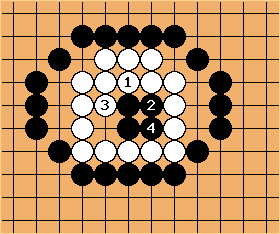 Seki cannot be formed since Black can not be forced to play any more stones, and capturing the available stones does not help. In addition, no eyes can be formed outside this area. ryoryo? : Just as a point of reference, this seemed unsettled to me initially, since I thought a play of white 1 would result in a seki. 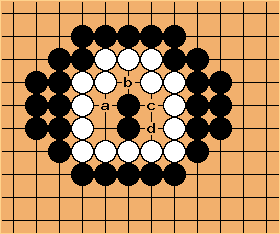 However, if black 2 at d, then white has no way to force a living eye-shape. If white 3 at a, then black 4 at c. If white 3 at c, then black 4 at a. And if white 3 at b, black can take his pick.